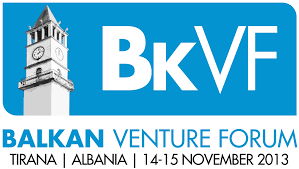 On November 14th and 15th the Balkan Venture Forum took place in Tirana, Albania. The objective of the 4th BkVF in Tirana, Albania, was to kick-start the local entrepreneurial, innovation and investment ecosystem, and integrate Albania into the global investment and innovation network. The two day event attracted more than 250 visitors, including entrepreneurs, business representatives, investors, mentors, government officials, donors, and students. The BkVF Tirana, Albania, was organized in partnership with the USAID Rritje Albania/Competitive Enterprise Development Project, and was inaugurated by H.E. Mr. Niko Peleshi, Deputy Prime Minister of Albania. The difference in Tirana, compared to the previous locations, was the much earlier stage of development of the local community. We focused on developing the local community leaders to be able to gain the traction with the international and local community, and sustain activities after the BkVF. Part of that was meeting and coordinating all local startup and entrepreneurship organizations, into a support group of the BkVF but also to local entrepreneurs. The other part was educating entrepreneurs and coaching them to prepare for success at the BkVF Pitching competition. For this purpose we already did one Venture Academy, a full two-day coaching program, and another half-day information and coaching session. Big thanks to Maxim Gurvitz, Michael Gold, Darko Arsov, Nik Grezda and the local support of PROTIK, AIDA and USAID Ritje for these coaching sessions. In addition, the BkVF Tirana hosted a pitching competition, where 29 startups from the Balkans were selected to pitch their business idea to an investor jury. As part of the pitching competition, seven startups were selected as winners, and were invited to take part in the European Venture Contest 2013, in Dusseldorf, Germany in December 2013. BkVF Tirana was implemented by Balkan Unlimited, Europe Unlimited, the VIBE project and Crimson Capital.